Parents of small children know that sometimes they seem to move as slowly as sloths, and author Jan Thornhill builds on this truism in her latest book. 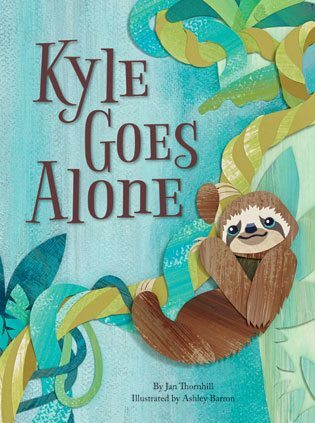 Three-toed sloth Kyle may only have to go to the bathroom once a week, but living high up in the rainforest canopy means that weekly trek is kind of intimidating. When his mom tells him he’s old enough to go alone, he’s not so sure, but when you gotta go, you gotta go, and eventually the little guy makes his way down to the forest floor and back up again. Thornhill uses gentle humour and a relatable storyline to teach kids about responsibility and overcoming their fears, but the real stars of the book are Ashley Barron’s gorgeous paper collage illustrations, which elevate a simple story to a thing of beauty.